In case you haven't heard, today is National S'more Day! A timeless summer treat that evokes childhood memories in all of us. Well, today I found a little twist on the campground dessert that is worthy of adult memories. Pour vodka and chocolate liqueur into a 64 ounce pitcher and stir. Refrigerate for several hours until very cold. Crush graham crackers and place into a small bowl. Rim 16 martini glasses with marshmallow creme. 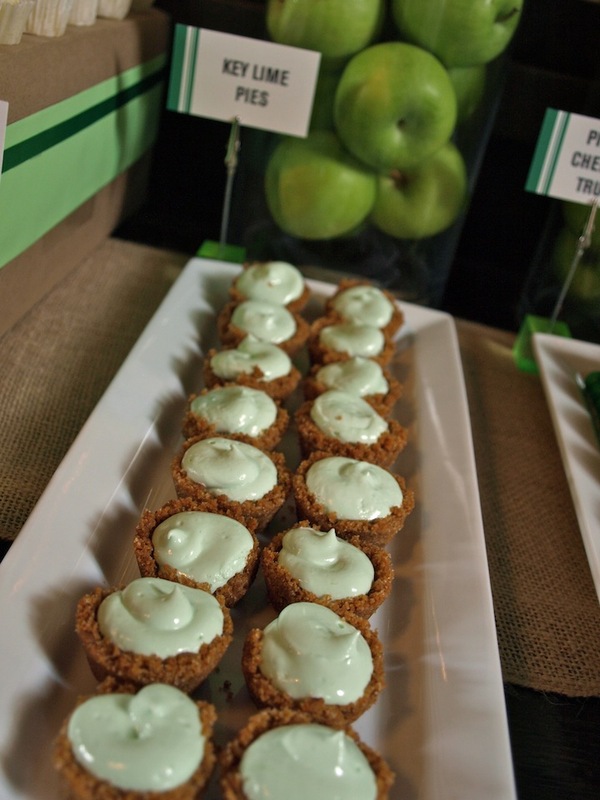 Dip glasses into graham cracker crumbs and shake gently to remove excess. Place marshmallows on skewers and toast over an open flame (grill or fire pit preferably). 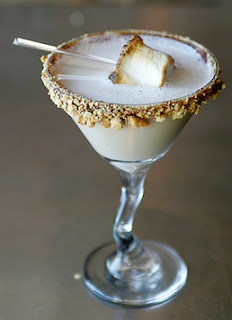 Pour 3 ounces of cold drink mixture into each prepared glass and garnish with toasted marshmallow. 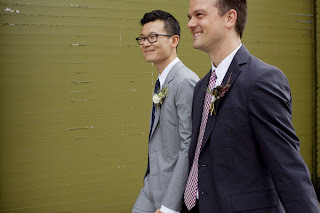 As I mentioned in the previous post, two of our dearest friends recently got married. 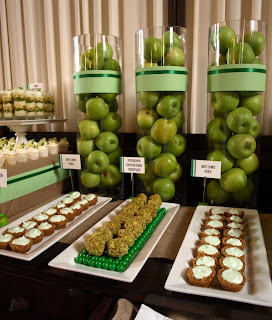 I, along with my incredibly helpful hubby, created the dessert table for the event. 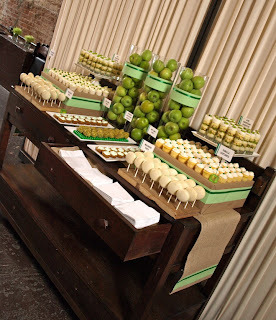 The venue was a great space in Brooklyn, NY called The Green Building. 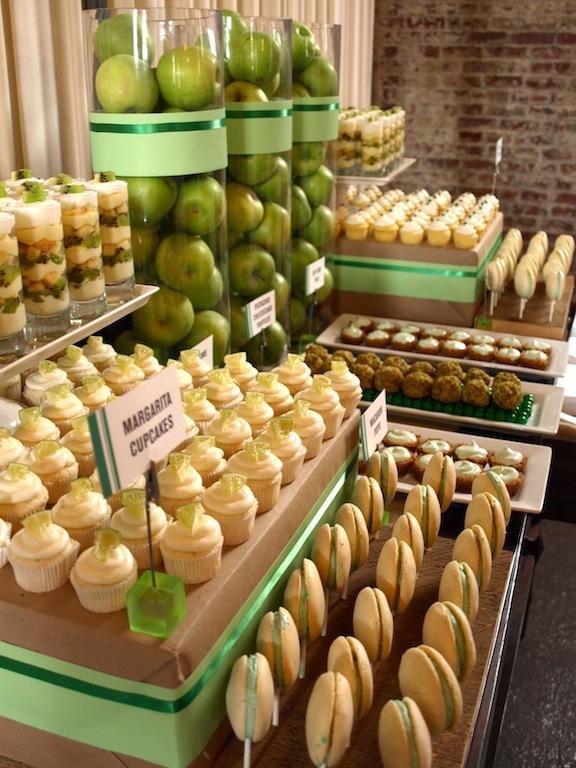 In turn, green became the color of the wedding. It was perfect - modern, clean, and so them! 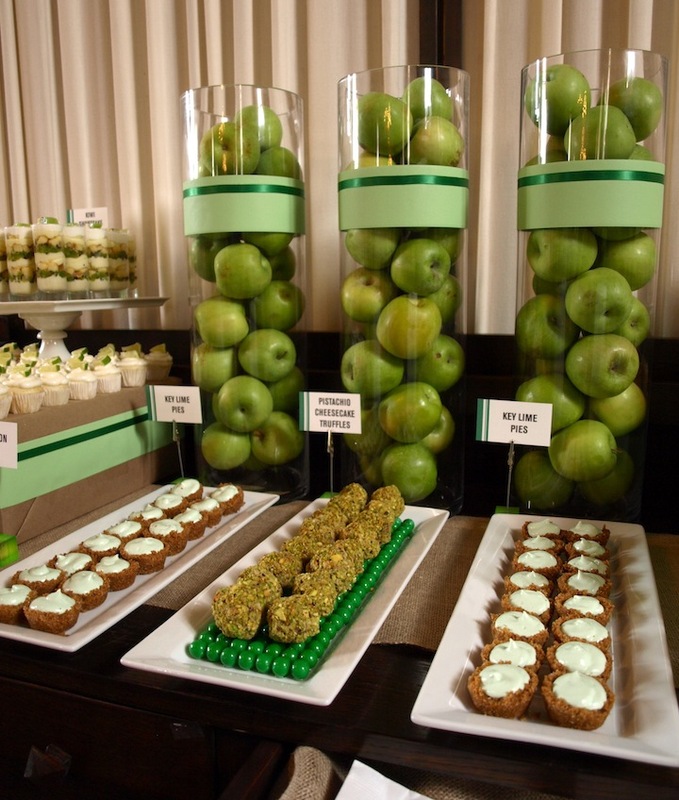 Now, trying to make a green dessert table was a bit of a challenge. I obviously wanted to incorporate the color, but in a natural form. Most green foods fall in the veggie category (not all that helpful when trying to create sweet treats.) So, I used green fruits, pistachios and little garnishes to capture the color, while keeping the rest of the foods a neutral white/cream. Due to the logistics of the day, I wasn't able to have the photographer shoot my table. So Jeromy and I set it up briefly, earlier in the day, so I could take a couple shots myself. With that said, there is one detail missing - the spoons for the kiwi shortcake shooters. I didn't put them in for the "mock-up" because I was afraid they would sink down too far and not look their best at the event. For the final presentation, the spoons were in. Seems silly to call attention to this, but I have had a few people ask "how did people eat the kiwi shooters? ", so I wanted to make sure and clarify. 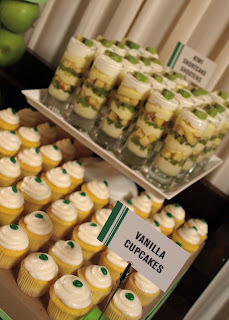 The desserts were kiwi shortcake shooters, vanilla cupcakes, margarita cupcakes, macaron pops, key lime pies and pistachio cheesecake truffles. Yummy! A couple of weekends ago, some of our best friends got married. It was a beautiful wedding!!! 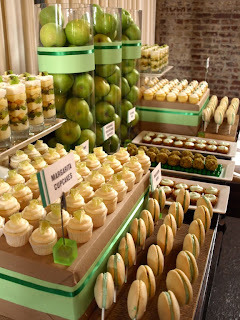 So much so, that today it was featured here on Brooklyn Bride. Congrats Max and Jejon! PS - I soon as I get my act together, I'll show you the dessert table I did for them.